Best Supporting Male Performance: Leonardo DiCaprio in "Django Unchained"
Leonardo DiCaprio - "Django Unchained"
Samuel L. Jackson - "Django Unchained"
Ben Mendhelson - "Killing Them Softly"
Ezra Miller - "Perks of Being a Wallflower"
I enjoy Leo's mugging and drawling as much as the next guy, but it shoulda been you, Ben Mendelsohn. His performance in Killing Me Softly was the only piece of acting that even approached the level of what Joaquin accomplished this year. And it should get extra points when contrasted with how bad his performance in Dark Knight Rises was that same year. But he does so much more than mugging and drawling! It's like he realized what he did wrong in The Aviator and is finally inhabiting a character without being ridiculous. 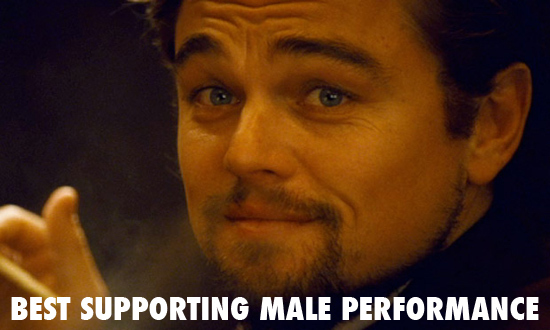 It's one of my favoritest performances of his, and I voted for him, and I don't even particularly like him as an actor. I need to see Killing Them Softly again anyway... I'll pay extra attention to Mendelsohn. I do remember him being pretty amazing in the heist scene. DiCaprio was good but he didn't even give the best performance in Django. Samuel L was a little hammy, but it was nice to see him actually acting for once. Waltz was exactly what I expected, which was top-notch and so much more dimensional than his Inglourious performance. Jamie Foxxxxxxxxxx was a lot better than I expected, and a constant reminder of what a huge mistake casting Will Smith in the role would have been.